A key aspect of the BBC's local sites is user generated content. Years before Youtube.com we had Video Nation - a way for the public to create and publish their own material. UGC is not just video. Increasingly we look with projects to ask the public to contribute their thoughts and feelings and their images to enhance what we produce. 'Have your say' forms and message boards give people a clear place to leave their opinion or write their memories of something which is relevant to them. Mobile UGC from SMS and MMS also provides us with a key opportunity for content from the public and a move away from just broadcasting to a publisher of both our own and the public's content. Have your say - Birmingham Tornado. MMS and SMS - Godiva Festival and Brighton Festival. Young Issue and Mersey Times - UGC publications created by the public. Video Nation - People's stories on the web. 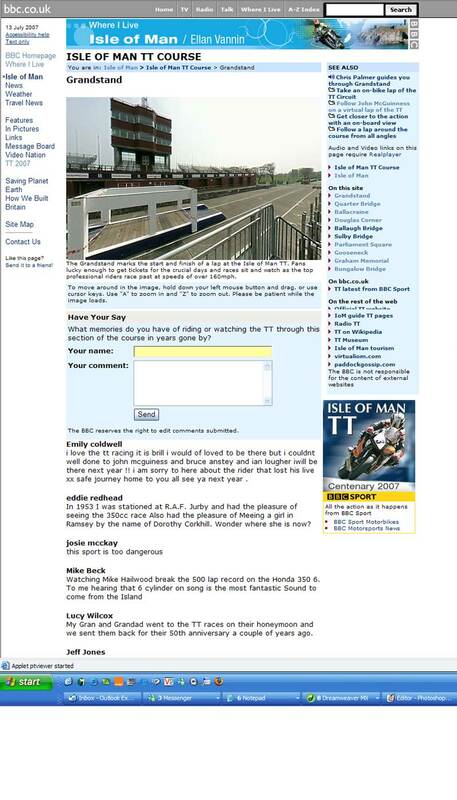 Isle of Man TT course - Memories and anecdotes from the Tourist Trophy motorcycle race in the IOM.